These are the bomb and the perfect Glamorous Extra to an Over the Moon Facial! I have about 6 different ones, sometimes more. 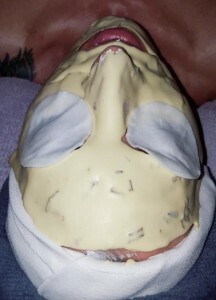 I will pick the best mask for your skin when you come in for your treatment. I just have some varieties listed here so you can get an idea. Coffee Espresso Reaffirming has been enriched with green coffee from Colombia and gives a lovely clearness to the skin. Collagen brings new life to your skin. Cranberry AHA is a Botox-like Peel Off that gently exfoliates and hydrates the skin. Vitamin C fights radical reactions and aids in collagen synthesis. Pumpkin is a rich source of antioxidants and enzymes that act like Alpha-Hydroxy Acids. Whitening is intended for all colors and contains no hydroquinone, which is known to have irritant effects.